Formula One's official tyre supplier, Pirelli, has announced new tyre markings for its range of slick tyres to be used at this year's test session, set to kick off in two weeks time at Circuit de Barcelona, Catalunya. The upcoming F1 season will feature 5 slick compounds in total, but only three of that set will be used at each Grand Prix. 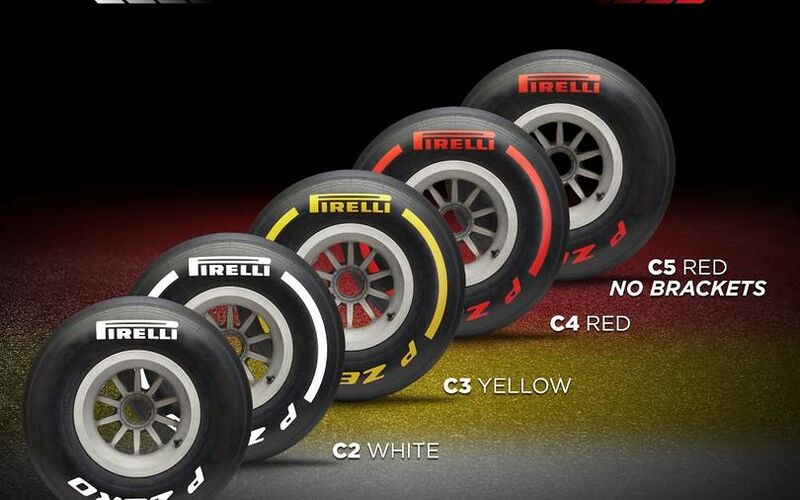 Contrary to previous years, where each tyre had its own colour, the used tyres will always marked as red (softest), yellow (medium) and white (hard). However, with all 5 compounds available in testing, and with Pirelli aiming to only use these three colours, an alternative solution had to be found. To help distinguish them, the hardest and softest tyres available won’t carry stripes on the sidewalls. This means that the tyre with white marking and no brackets will be the hardest, while the red tyre without brackets is the softest of the range that will be made available throughout the season. “Normally we will only see three colours at every race, so we’re only using three colours at the tests as well", said Mario Isola, Head of F1 and Car Racing at Pirelli. Formula One testing kicks off on 18 February at Barcelona.